Benches are beloved for their unique pairing of chic seating with stylish storage capabilities. From classic to contemporary, traditional to transitional, this versatile collection of entry way benches has a variety of styles that are sure to strike your fancy. 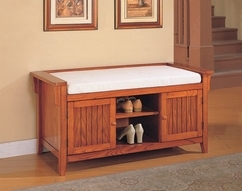 Our Benches are sold at discount prices and ships FREE to the continental U.S. , usually within 3-4 days!